After reading the 10 things you might not know about Star Trek V article last week, and finding myself nodding along in agreement with a lot of the comments, I had a couple of hours to kill and figured I'd watch The Final Frontier again. I never jumped on the whole "worst Trek movie ever!" bandwagon, as I think every Trek movie offers a high level of enjoyment, but I must admit I'd not watched it in at least a decade, with the DVD remaining in near perfect condition whereas other original crew movies had seen plenty of viewings. Possibly it's down to maturity of age (mine and the movies), but I enjoyed this viewing of The Final Frontier much more than I expected to, and what's more, after watching again I believe there's a case to be made that it is actually the truest of all the pre-reboot movies. Star Trek V wears its negative aspects on it's sleeve, and they are there for all to pick-up on, Trekkie's and non-Trek fans alike. It's light on action, lighter still on special effects, and there's no real antagonist presented in the traditional sense. These are the reasons, I believe, that it has such a poor reputation, as they are things that most people going into a Star Trek movie, or indeed any blockbuster science fiction movie, would be looking for. For me though, and I suspect a lot of Trek fandom, I'm looking for more than spaceships and laser guns in a my choice of cinema. Taken in context, if you've worked your way through the previous four films and reached The Final Frontier, then a lot of those negatives I mentioned above become very apparent, jarringly so when just viewed like this. But if you take Star Trek V out of the movie series and put it up against The Original Series, and then think back to some of the great episodes presented there, like I, Mudd, The Trouble with Tribbles, A Piece of the Action and The Empath, it soon becomes clear that Star Trek V is very much in the tradition of that original 1960s series, and perhaps wisely, Star Trek V gives the film series a well timed pause for reflection on its origins. The plot of the film doesn't really emerge until nearly we're about 45 minutes into it, and rightfully so as this isn't a plot-driven film. The Final Frontier is a movie about friends, personalities and what makes us who we are. It's a movie which just happens to be set in space with a bunch of aliens and such. But if you're a true Trek fan, you'll remember that this is exactly how The Original Series often was. Episodes like The Deadly Years and All Our Yesterdays were not so much about plot as they were about the characters, Kirk, Spock and McCoy, and the complexities of their interaction. We see the good old Spock-McCoy bickering, the dynamic between Kirk's fiery emotion and Spock's stoic coolness, and above all, we are reminded that these three are best of friends through thick and thin. Star Trek V: The Final Frontier also has the spirit of adventure, the seeking out of the unknown, and so in all of these ways it is the truest of all the Trek movies. William Shatner pulled upon the characters 1960s origins more than any other writer/director did in the whole Star Trek movie series. No, it may not be quite the heart-pounding sci-fi shootout that The Wrath of Khan was, but that was never its intent. I take my hat off to Shatner for having the integrity to take us back to those original Trek days, even at the risk of potentially boring a new generation of fans. Tell me, what science fiction movie has the balls to give us a campfire scene with the three main characters singing Row, Row, Row Your Boat? ...Twice! This is Shatner's love letter to Trek fandom, and if anyone can be blamed for its failings then it surely has to be the interference of Paramount, who pulled back on budget, lost faith in Shatner's direction and ordered multiple changes. Such a shame they will not let him present a director's cut. Behind the scenes William Shatner had minimal experience in the director's chair, and I'm not claiming he had no assistance here, but this only goes to show just how much of a visionary he is. Shatner made excellent use of lighting, shadows, perspective and a few Hitchcockian tricks along the way. This was his only major directing effort (not including documentaries & TV shows), think how many other director's achieve so much with their first major motion picture? Look, I'm not going to sit here and tell you that The Final Frontier is my favourite of the original run of Trek movies (pre-reboot), but I'll take it over Nemesis, I'll take it over Insurrection, it's there with Generations, and I might just go for it over The Motion Picture. 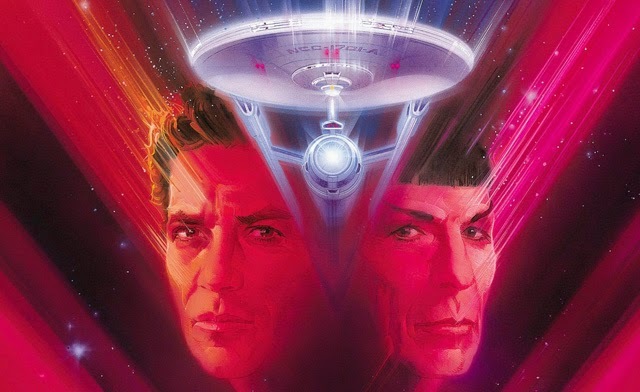 It's underrated and lives in the shadow of unfair negativity, but for my money Star Trek V: The Final Frontier is the most human of all the Trek films, the most humorous, and the most poetic. By day, an ordinary bloke in a dull 9 to 5. By night, a tired ordinary bloke. Martin still hasn't worked out what he wants to do when he grows up. He is currently 47.